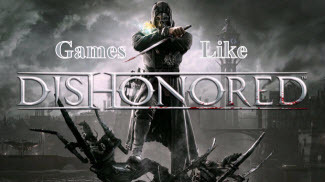 Dishonored is an action-adventure game played from a first-person perspective with an emphasis on stealth action. The game is set in the fictional, plague-ridden industrial city of Dunwall which follows Corvo loyal bodyguard of Empress is falsely accused of her murder, is left for dead. With the help of empire loyalists Corvo escapes from the prison seeking revenge on those who have murdered his charge. If you are a fan of action-adventure and stealth games like Dishonored and looking for more games with similar gameplay then find the recommendations for it below and don't forget to mention if we miss any games as we keep on updating this list. Deus Ex: Human Revolution is a first-person shooter, cyberpunk-themed action role-playing video games. The game is set in 2027, 25 years before the first title where players take control of Adam Jensen and search for those responsible for attacks against Sarif Industries, a leader in augmentation technology. BioShock is a first-person shooter with role-playing game customization and stealth elements developed by Irrational Games, and published by 2K Games. In 1960, a lone survivor of a plane crash named Jack discovers an abandoned underwater utopia, only to find out that the mystery behind its creation is much more sinister than he first believed. Far Cry 3,......if you can think of more, then don't forget to mention it in comments.